We’ve got some great news for those of you who like to see things in action on video before they buy (ok so maybe most people like to see them in action 1st! 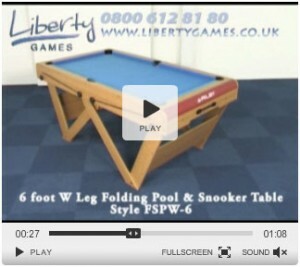 ), we’ve just uploaded a bunch of new videos for the ever popular BCE / Riley range of folding games tables. These tables are always extremely popular, especially around Christmas as if you have more limited room for a games tables in your home or business then these tables allow you to conveniently store the table away when its not in use. We do get a few questions about how the exact mechanism works in terms of folding the table down, which is something hopefully these videos can help answer! You’ll be able to see each table both in play, and being dis-assembled ready for storage so you can see how quick and easy it is for yourself! We sell hundreds of these extremely popular tables every year, and luckily due to their relatively small size we can get these our right up until Christmas. However stocks have been known to run out so its always a good idea to order early to avoid disappointment! As always if you have any questions regarding our range of BCE games tables or anything else please give one of the team a call on 0800 612 8180 and we’ll be happy to help.